Swingtel recently announced the launch of a new smartphone named TIGERTAB which is going to pack a quad core processor and few intelligent features. Its name suggests that device is a tablet but in reality it’s a smartphone as it features 4.7 inch display. Yes off course it’s an Android smartphone which is priced at Rs 12,000 only. So, the TIGERTAB is out now to compete with other similar smartphones. Here I start with the detailed specifications of the TIGERTAB smartphone. 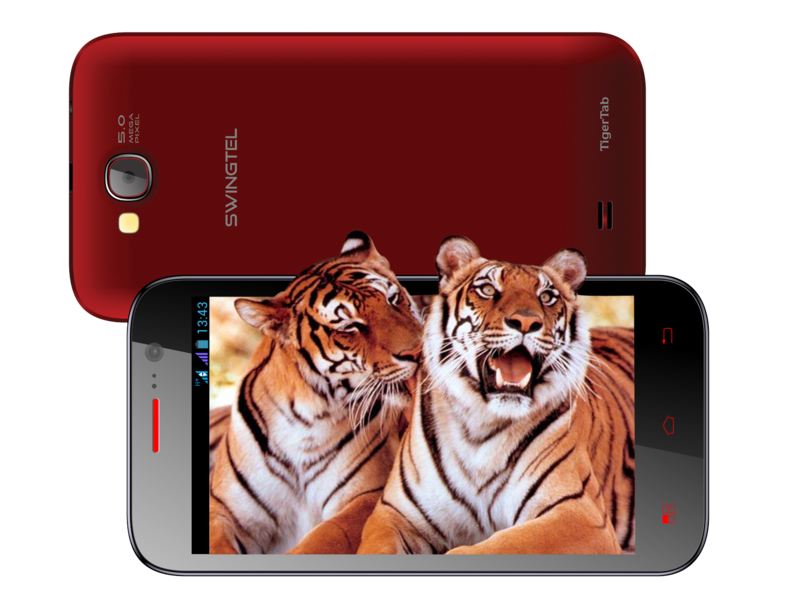 The Swingtel TIGERTAB smartphone got a good design to start off and it will definitely attract the customers. The design basically looks like every budget price Android smartphone. The back got camera with LED flash and down below is the loudspeaker. The front got a camera with speaker along with three touch buttons. Swingtel is providing two back covers free with the device so that users can change the color of their smartphone anytime they want. The device is available in three back colors, red, black and white. The Swingtel TIGERTAB smartphone features 4.7 inch display measuring diagonally and it’s been added on a Super View smooth capacitive panel featuring near to HD resolution. The company is claiming that playing full HD videos will be no pain but it’s not easy to believe. The MediatekMT6589 chipset has been used on which quad core processor with 1.2GHz clock speed has been added. There is also a GPU of brand PowerVR to meet the graphics requirements. There is 1GB of RAM and 4GB of internal storage in which 1.75GB will be available for users and 1GB will be kept for the apps. The storage can be expanded up to 64GB using microSD card. So the smartphone is looking good at CPU and storage department. Presence of GPU will definitely make the difference in the performance. There is a 5MP camera sensor at rear which is supported by LED flash. The camera is said to be autofocus and capable of doing video recording as well. Other features with rear camera are touch focus, face detection, smile detection, panorama and lots of effects to edit pictures. There is also a 1.9MP camera on the front to let users do 3G video calling. 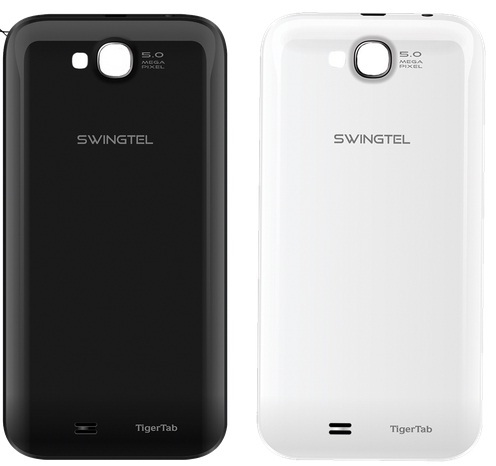 The Swingtel TIGERTAB smartphone supports dual SIM cards (one 3G and other 2G). Yes, it supports 3G cellular network and it also got Wi-Fi and Bluetooth (4.0) as additional data connectivity features. There is GPS as well to let you know your location and the Wi-Fi hotspot feature is also there. It runs Android 4.2 Jelly Bean which is really good thing to have as there are not much smartphones available running this version of Android. The Android will not be the pure version and there should be some skin added to it. The smartphone features few other smart apps like face unlocking and voice unlocking. Having Android 4.2 is definitely a plus point for the device and its price is also going to attract customers but I think the device name should have been different as it sounds like a tablet but in reality it’s a smartphone.